I was accused this week of cramming my “gay agenda” down a throat or two. I am gay and I do have an agenda, so that part is correct. I humbly disagree with the “cramming” part however. But I want to thank that person, it got me angry enough to blog again and I have been suffering from writer’s block this summer. Yeah, it’s going to be one of those…so if you prefer my funny childhood memories, click off here and have a good day! For those of you still with me, here I go. I do not believe that striving for equal rights in the United States….US Constitutional rights is ‘cramming’ anything down anyone’s throat. Of course, the haters will always disagree with me. James Earl Ray probably pulled the trigger because he couldn’t stand MLK Jr.’s non-stop harping on equality for black people. Why didn’t MLK Jr. just stop that and accept his second-class citizen status? Well, he had the law and righteousness on his side, that’s why. MLK Jr. had death threats every day, but continued to get up every morning and fight for his rights and others. Now, in no way am I saying I am on the same level as that of my hero, MLK Jr.. I like to think that growing up reading about him and my other hero, President Kennedy, that their vision was ingrained in my psyche. I feel their words deep inside of me, I feel their passion. It’s that righteous anger again. Now the Bible, Ephesians speaks of righteous anger…that anger that is expressed in such a way as to bring glory to God. I am not a Christian, but I like to think that Christians would say that’s fighting the good fight. Fighting for equality under the law would be something that their God would think was righteous. I will get hateful and angry comments sent to me because I just wrote the above paragraph. They will try to say that queers are going to burn in hell…even though Jesus never did address homosexuality….you can’t prove that to me. I have to authorize all comments to be posted on my blog, so haters beware. Most of the time I do not allow your comments, so feel free to blast me to burn, but know I am the only one that will read your commentary. I bring up religion because all the haters…uh er, Christians always want to say that the Bible says ONE MAN and ONE WOMAN. A family member “friended” me on Facebook this month, then put that as her status. Facebook is the best thing EVER in my opinion. The lying faces that smile at you at family reunions cannot resist posting their thoughts for the world to see in social media. It is a wonderful thing. She felt righteous about posting it because she was acting under her beliefs and I felt wonderful “de-friending” her, acting under mine. Win, win. The family member felt compelled to write me an email and say that I was going to burn in HELL, not for being gay mind you, but for not following the WORD. I am glad she feels badly for me and will miss me in heaven. Like Billy Joel sang, I would rather laugh with the sinners, than cry with the saints. Is it getting warm in here?? I won’t go into my Constitutional argument for marriage equality…read previous blogs. I will reiterate that I do not want to marry in a church…yours or anyone else’s. Marriage in the U.S. is a civil contract….so keep the Bible out of it, okay? The inevitable is going to happen, marriage equality is going to become the law of the land. I think that is why the haters are getting so angry and revving up their engines. Dan Cathey, the President of Chick Fil A, admitted recently what has been widely known for years in the gay community. He admitted that the company is against marriage equality and has made million dollar donations to fight against it. Now, if someone makes this statement, which he has every right to make in America, you gotta know there is going to be a fall-out. He made a tactical decision to verbalize the company policy, good for him. Always good when the haters make themselves known whether in your family or at your local chicken shack. Now imagine, someone is saying that a national business has donated millions of dollars to keep you from exercising your US Constitutional rights. How would you feel? My family member is straight and married to a white person. But what if they wanted to marry a black person and it was before Loving v. Virginia was decided by the US Supreme court in 1967? What if the local owner of the chicken shack started mouthing off about the black person they loved and wanted to fight against their right to marry them? The family member happens to live in North Carolina, where in 1967 it was ILLEGAL for a white person to marry a black person. The first interracial marriage in that state occurred on October 6, 1971 when John A. Wilkinson’s marriage to Lorraine Mary Turner was officially recognized, Wilkinson was black and Turner was white. North Carolina was one of 15 states that had to change their law after the Loving case was handed down. It seems my family member has probably settled in the right state for them…if you get my drift. So my point is, I am sorry if you view my continued struggle for my rights as cramming it down your throat! I know if you were in the same situation you would act just like I am acting. That is the funniest thing about the whole deal. The downtrodden, the disenfranchised, the abused, the discriminated against ALWAYS get both sides. Why don’t the opposition see it? They do, they insist on making the religious argument when they know it is a civil right…because under the laws of this country, they know they are going to lose. I am going to hold the course on my gay agenda. I am going to continue to lose family members in my righteous battle for equality. It is all good, I sleep quite well at night. MLK Jr. was a man of God and a reverend. I know some of you will say that if he were here today, he would be against marriage equality. I do not think anyone can make that assumption. I will not pose an argument….I will just leave you with this quote. Get some righteous anger my friends. 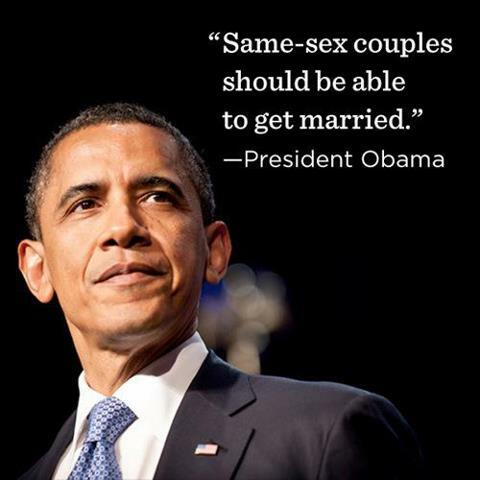 What a historical day, May 9, 2012, became as President Obama FINALLY verbalized his support for gay marriage equality. As a former Constitutional law professor, we all knew how he stood internally, the conflict had always been WHEN to tell the world how he truly believed…how any educated and knowing person believes. Whether you love queers, hates queers, or are a queer…the answer is the same. All Americans are afforded equal protection under the law, guaranteed by the 14th Amendment to the U.S. Constitution. I expected him to wait until after he was re-elected, then to make the announcement. Politics and the way it makes rational men behave is a sick system, but I understand how the game is played. The unbelievable courage it took for him to give the interview before the election makes me respect him on a whole different level. Now, don’t think me a fool, I know this move was plotted out, internal polls and statistics considered…but I still know it was the equivalent of laying down a black-jack bet in Vegas. I think it might turn out to be a total wash. That is, the number of votes he lost with the announcement is about equal to the number of votes he gained. The majority of votes Obama gets in November, he was going to get on May 8th. I am sometimes accused of being a “one-issue” Democrat. Well, hello??? Wouldn’t you be if YOU were being denied a basic civil right because of one genetic marker you just happened to be born with? Why the hell would I vote Republican when Mitt is preaching that he will push for a U.S. Constitutional amendment defining marriage as one man and one woman?? Sure, let me vote Republican and then go home and stick pins in my eyes! Good grief! The only thing…the ONLY thing that would be interesting if Mitt Romney becomes the President is the separation of church and State issue. All of the Bible-thumpers who are always screaming that they want religion back in the halls of government and in our schools will be doing a complete 180 in their thinking. The first time they hear President Romney talk about his magic underwear in the oval office, the Southern Baptist Convention will issue a statement on what a beautiful thing we have in the Separation of Church and State in America!! It is funny when I think about it that the racists who sooooo hate Obama have to live with the fact that Palin and McCain were such a bad ticket that America voted a black man into the White House! They have had FOUR years to get the black man out of there and a Mormon is their best candidate?? I can’t wait until Romney picks his running mate! Guess what haters? It took the first black President to look into the camera and acknowledge my existence as an equal citizen!! I have watched my hero, John F. Kennedy’s, June 11, 1963 civil rights speech dozens of times. I watched it again on May 9, 2012.
Who among you would want to wake up tomorrow and know, at your soul’s core, that you were gay? Life as a queer girl in Texas is not an easy road. I am humbled and grateful that President Obama was not “content with the counsels of patience and delay” when he decided to speak out in the second week of May, 2012. On April 19, 2012 President Obama visited the Henry Ford Museum in Michigan. The museum houses the infamous bus where American hero, Rosa Parks, declined to yield a seat to a white man. The President took the exact same seat and pondered. I know I was thinking it was a complete “full-circle” moment when I saw the photo taken that day. “I just sat in there for a moment and pondered the courage and tenacity that is part of our very recent history but is also part of that long line of folks who sometimes are nameless, often times didn’t make the history books, but who constantly insisted on their dignity, their share of the American dream,” said President Obama. 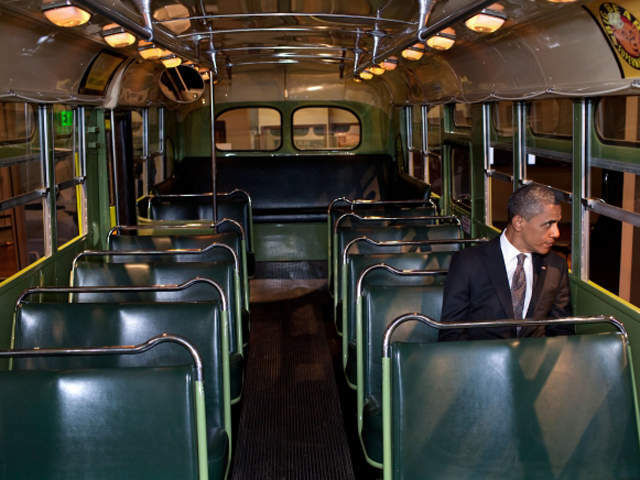 I like to think that when it came time for the President to pick the date for his equality statement that he thought for a second about sitting in that bus seat. My being gay is as unchangeable as skin color, some people don’t believe that, but it is a fact. I have never made a stand like Ms. Parks, where my physical well-being might have been threatened. I do like to think that with every word I speak, with every word I blog, maybe someone who hasn’t listened or paid careful attention before, well…maybe they do at last. At last, a sitting American President stood up for gay Americans. I know how black Americans felt now on June 11, 1963. Tears roll down your face, your chest heaves, and you are speechless. That’s right, I became speechless. For once, someone else, someone of greater significance was speaking my truth. I am forever thankful that President Obama sat in my seat on that day.